Nan Drye: Happy New Year! After the post on December 22nd I decided I didn't really need to do any more experiments on fabric until I have a better idea of how long the color from poinsettias will last. So, rather than waste the plant, I decided to do some prints on paper. 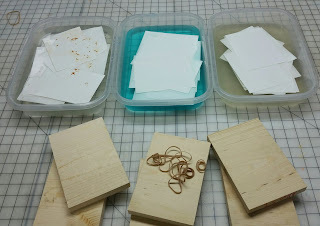 Since people keep looking to me for instruction on paper I thought this would be a good way to show you what I do with paper, but there are several ways to do it. 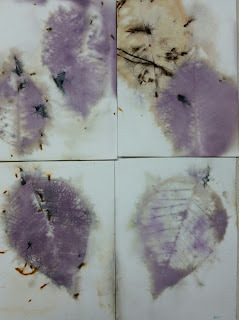 Remember to click on the pictures of the finished paper to see the differences in color and detail of each mordant. I use small pans I got at the dollar store (approximately 9"x 13" and about three inches deep) to soak the paper in. It should soak about 30 minutes. 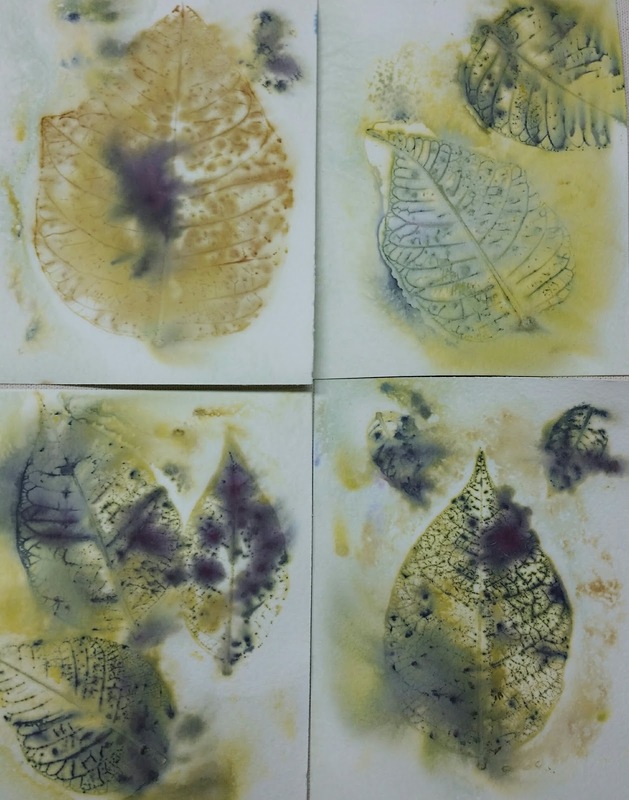 You can soak it in a mordant solution one day, let it dry and re-wet it on another day and eco print, but it is perfectly ok to just soak it and eco print on it in the same day. No wait time is really necessary. I use 140lb watercolor paper, but any heavy duty paper will work. Remember, this is not archival, you are taking a perfectly good piece of acid free paper and adding all kinds of things that will cause its eventual demise. The pan on the left is water with a quarter cup of vinegar in it. The paper has been pretreated with steel wool. The center pan is water with about a half cup of copper liquor and plain paper. The third pan is water with about a tablespoon of alum in it. 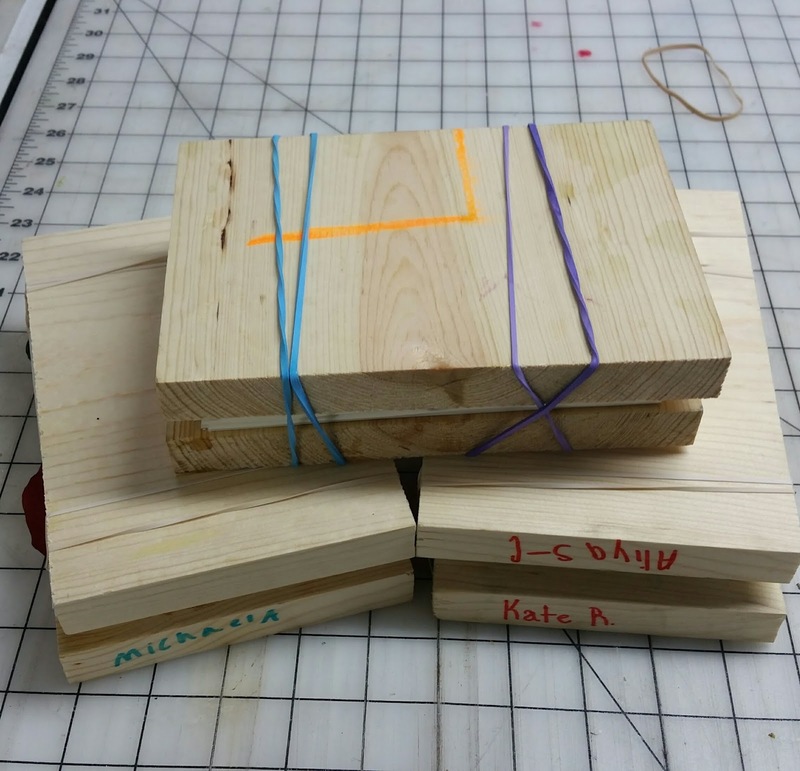 The boards are what we will use for a press and you need string or rubber bands to hold the whole thing together. 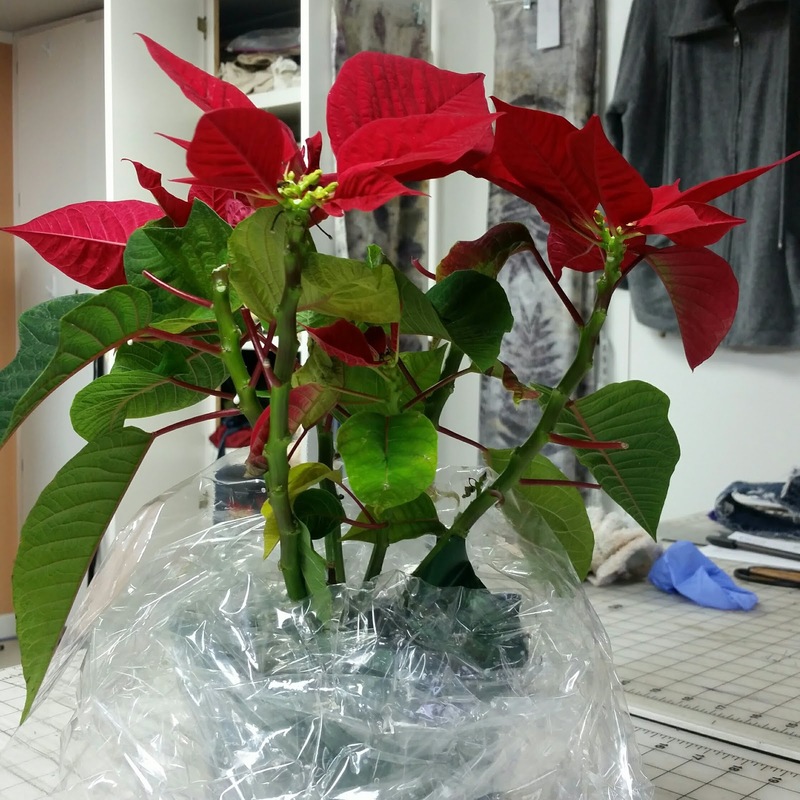 Since your hands will be in and out of the mordant and, as we discussed the other day, poinsettias are kind of gnarly wear gloves both to build the blocks and open them up. Start by laying down a board with one piece of paper on it. 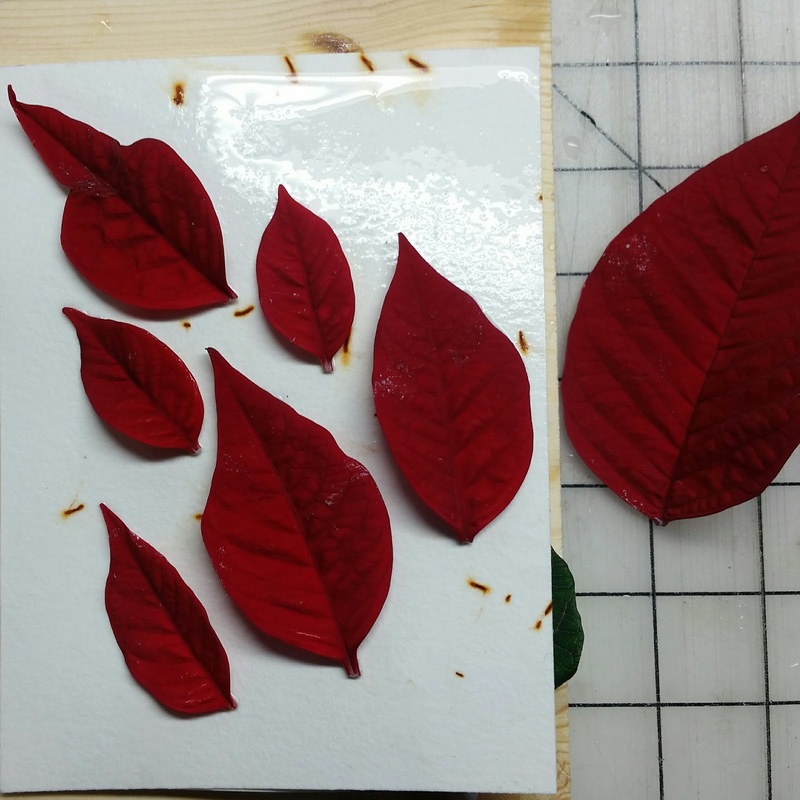 Place the leaves (I used both the green leaves off the plant and the red "petals") with the veined side of the leaf against the paper. This is especially important if you are using paper treated with rust as unlike fabric, the rust is pretty much on only one side of the paper. 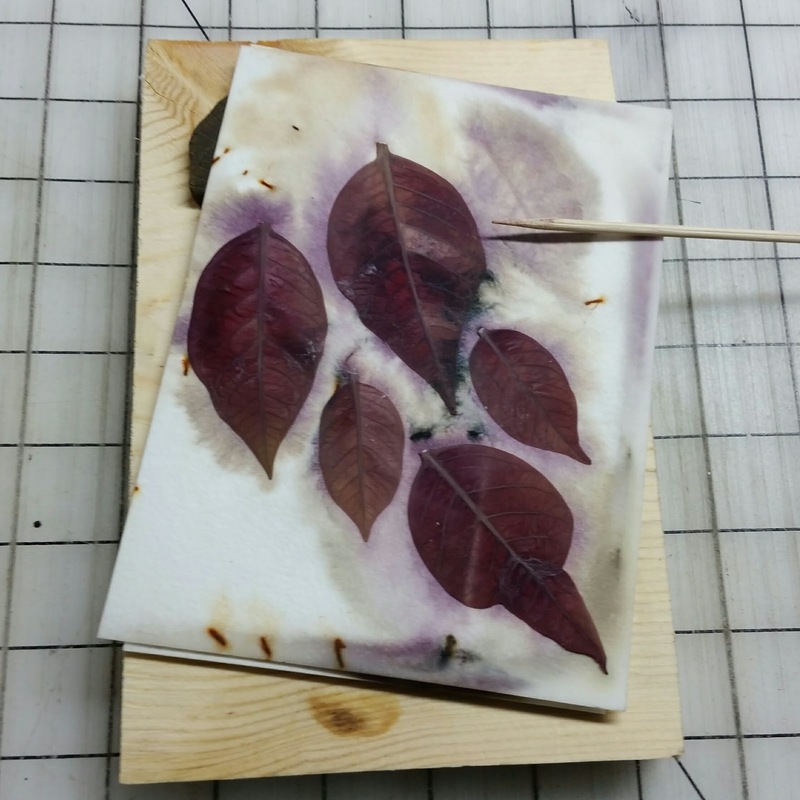 Use paper with one mordant at a time, meaning work you way through one pan at a time in each set of boards. The eco print police won't come and arrest you for mixing different mordants in a block, but in the beginning you want to learn what the results are with each individual mordant. After that if you want to see what mixing the various mordanted papers is like-go for it. 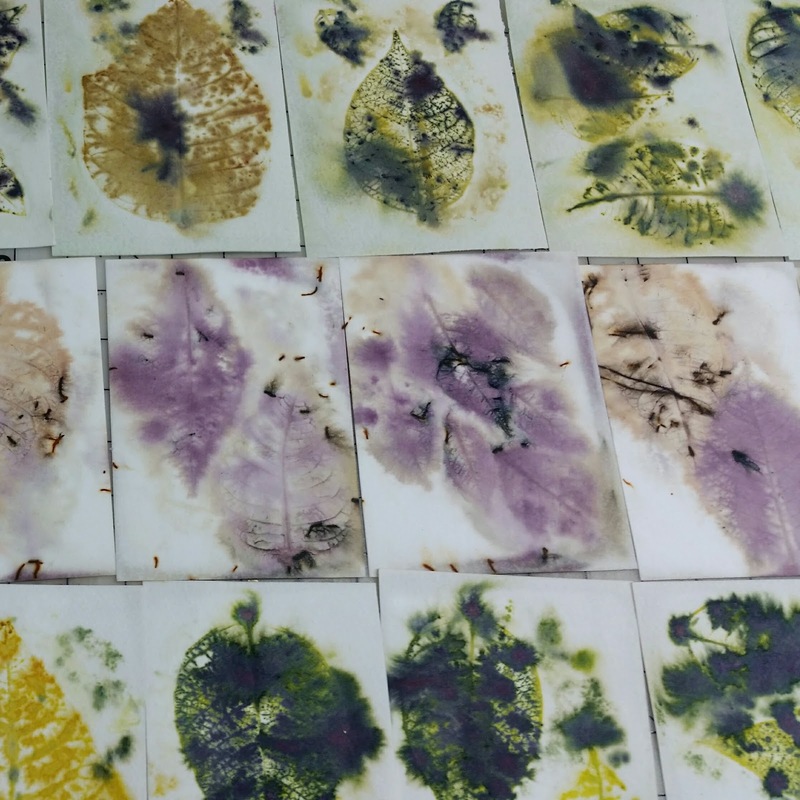 This is a very wet process and you will get different results when the different mordants drizzle through the layers of paper and affect each other. You can see the green leaf peeking out below. When you get done with the papers in one pan, put the the other board on top and rubber band the block. 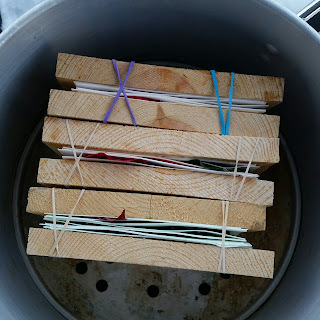 I did use colored rubber bands on the block with copper liquor paper in it just to make sure I could tell it apart from the one treated with alum. The colors from either can be so bright that sometimes it is hard to tell them apart after the fact. If you are wondering about the names on the boards, I thought eco printing on paper to 20 elementary school students and it was the only way I could get each kid's block back to them after they all went in the steam pot. If you take a class from me you can either be "Kate A" for the day or write you own name on the block. I use one inch boards as they don't warp as fast in all the steam, but after a while they will. I have used cardboard, but needless to say that is a one shot deal. The bigger boards do take up more room in the pot however. Into the steam pot they go! In this case a tamale pan. It is built for this as the strainer the tamales would normally set on is low enough in the pot that the blocks fit right in and still be able to get the lid on tight. It also holds just about 30 minutes worth of water, but set a timer so you don't let it boil dry. Remember, pans for dyeing should be dedicated to that only, no use for food after this. While the point of natural dyeing is to be safer, there are just somethings in this world we should not ingest. Remember that wet paper is pretty delicate. I discovered a bamboo skewer is a great way to nudge one sheet of paper off the next one down and pick up stubborn leaves. Less damaging than your fingernail. Here they all are laid out to dry. The top row is the copper mordant, the middle the rust, and the bottom the alum. Up close with the copper. The green leaves tended to be beige and the red had all kinds of color coming out of them. Up close with the rust. 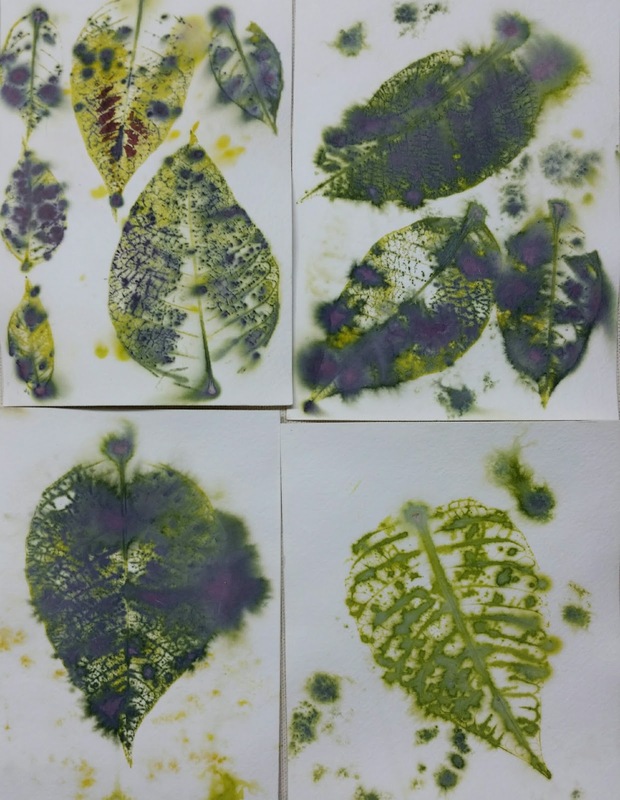 Note that the prints are more diffuse and that in several places the rust turned black where interacted with the plant material. 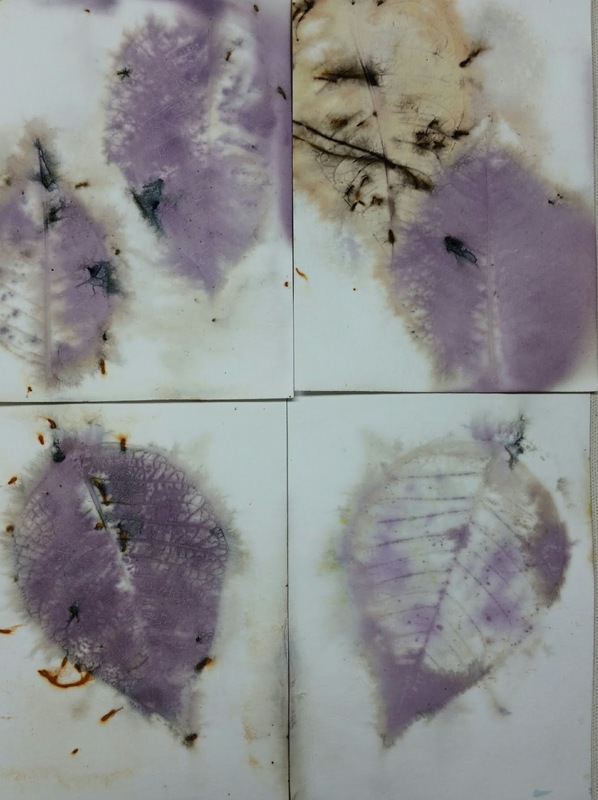 The bottom two show the difference between the top of the leaf and the underside, the underside of the leaf being the darker more solid one on the left. Again, the green leaves tended towards beiges and browns. Up close with the alum. All the leaves tended to put out some sort of green or yellow, but a lot of the red ones put out purple splotches. Very zingy. After the paper dries out it will be somewhat warped. I have had pretty good luck ironing it out when it is really "bubbly" but I also use it as is most of the time. If you can't think of anything to do with it for awhile, you can set it under a heavy book. It can be used for journaling and scrapbooks, but remember it is not archival so it is best if it is not placed in a scrapbook where it will press up against photographs, especially vintage ones. The poor thing looks like somebody went after it with a weedwacker!